Al Hartmann | The Salt Lake Tribune Hundreds of people rally at the Utah Capitol Rotunda on Thursday, Feb. 20, 2014, to support Medicaid expansion in Utah. For an extra penny on the price of a movie ticket, RyLee Curtis said, Utahns can provide essential health care to 150,000 of their neighbors, friends and family members. But state leaders warn such an expansion of Medicaid could eventually overtake much of the state budget, crowding out other needs. It’s a choice voters will make in November when they consider an initiative to fully expand Medicaid in the state. 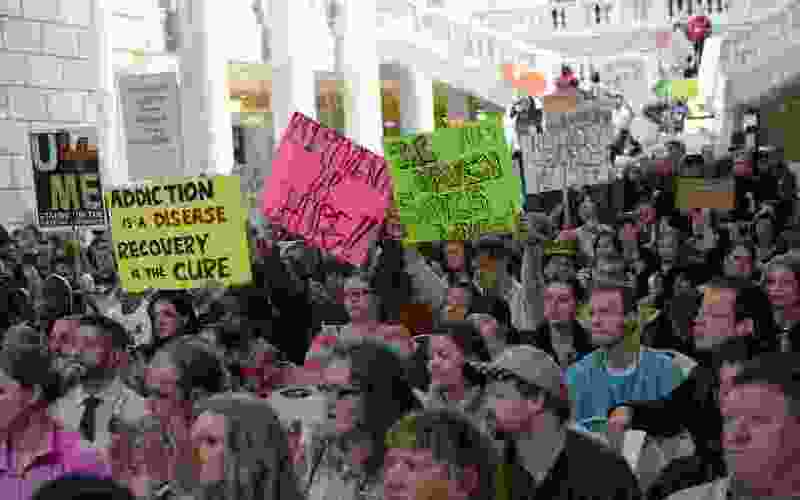 The proposal would combine roughly $90 million — through a state sales tax increase of 0.15 percent — with $800 million in federal funding to provide medical coverage to Utah’s poor. A new poll, by The Salt Lake Tribune and the Hinckley Institute of Politics, shows a majority of voters are on board. Full Medicaid expansion was supported by 54 percent of poll respondents, compared with 35 percent who opposed the initiative. The initiative also received support from both men and women, Democrats and Republicans, and all ideological groups except the “very” conservative. The poll was conducted by the Hinckley Institute between June 11 and June 18. It included responses from 650 registered Utah voters and has a margin of error of plus or minus 3.8 percentage points. Utah has incrementally expanded Medicaid since the passage of the Affordable Care Act, known as Obamacare. The 2010 federal law created a coverage gap in states that opted out of full expansion, with some making too much money to receive Medicaid under the old requirements but too poor to qualify for Obamacare’s insurance subsidies. The state received a waiver in 2017 to partially expand coverage to 6,000 poor adults without children. And in March, lawmakers approved HB472 — in part, a response to the full-expansion ballot initiative — which seeks a new waiver and additional funding to cover families earning up to 100 percent of the federal poverty line. Full expansion would cover families earning up to 138 percent of the poverty line, and the federal government has been resistant to requests by other states to impose caps and restrictions like those called for by Utah lawmakers. Sen. Brian Zehnder, R-Holladay, sponsored HB472 and made Utah’s pitch to federal health officials last week with a group of state leaders. Zehnder said his bill would expand coverage to roughly 70,000 people if the waiver application is approved. It would also do so without the need for a tax increase, as it would redirect some federal and state dollars. “We’re taking money that we’re already spending,” he said. Zehnder said he’s invested in his bill and would like to see it implemented. But he added that he’s comfortable with Utah voters weighing in on the issue in November and that’s he’s currently undecided as to how he will cast his vote. As a family physician and lawmaker, Zehnder said he understands and feels the desire to take care of everyone regardless of ability to pay for services. But, he added, doing so comes with real costs to the state. But Curtis, manager of the initiative campaign, said lawmakers like Zehnder have had years to debate and consider the best approach to Medicaid. During that time, she said, the state has turned its back on sick and impoverished residents.